Posted on January 16, 2013 by Clare Cooks! Sometimes I get a bit indecisive when it comes to making certain meals. I try to make a rough meal plan every week mainly to make both shopping and blogging a bit easier on myself, but sometimes I just don’t stick to it. Despite my best efforts to plan ahead, sometimes I just don’t feel like what I had previously planned out. 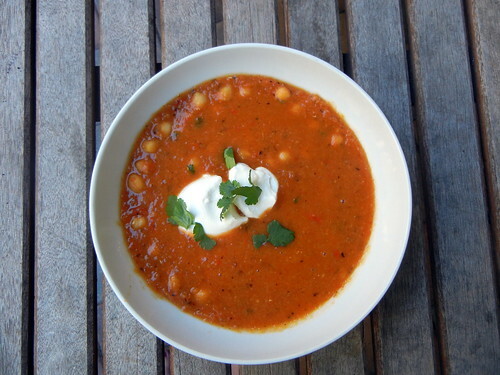 On this week’s plan I had both lentil soup and tomato soup. It’s been super cold here lately, so soup is in high demand. 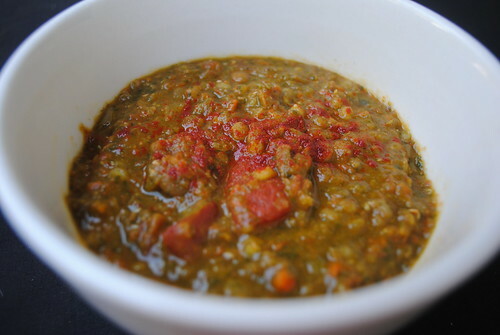 When it came time to make lentil soup for lunch one day, it just seemed kind of blah… I really wanted tomato soup, but it didn’t really seem filling enough. Then I got wonderful idea of putting the two together. I’m quite happy it did. The end result had everything I wanted. It was tomato-y and comforting and filling and hardy all at the same time. If I had time (aka if I wasn’t starving for lunch at the time) I would have chopped up some more veggies to add to the soup. Carrots would be perfect in this soup. I did throw a couple large handfuls of spinach at the end to add some sort of vegetable and color (hard to see in the picture, but it’s in there). The green onions were a last-minute, impulsive addition and were amazing on top. The soup itself is completely vegan. I decided to add a couple spoonfuls of greek yogurt to stir in for a little extra creaminess, but it’s definitely not necessary. In a large heavy bottomed pot, heat the olive oil over medium-high heat. When oil is hot, add onion to the pot and cook until soft, 6-7 minutes. Stir in garlic, paprika and cumin. Cook 1-2 minutes, until fragrant. Add in tomatoes, juices and all. Bring to a boil and reduce heat to low. If using whole tomatoes: With a handheld/stick blender, blend the tomatoes and onions until mixed, but still slightly chunky. 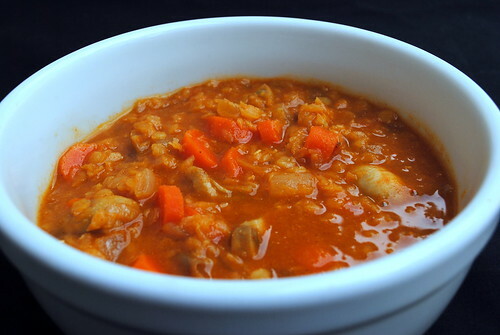 Bring heat back to medium-high and add in the broth and lentils. Bring soup to a boil, reduce heat to low and cover. 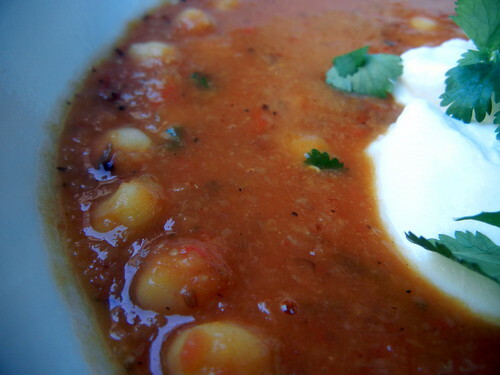 Allow soup to simmer for 20-25 minutes, or until lentils are soft and have absorbed some of the liquid. When lentils are soft, add in baby spinach and stir until slightly wilted. 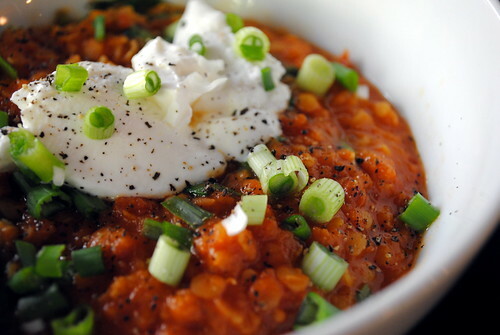 Put soup in serving bowls, top with green onions and greek yogurt, if desired, and serve. Posted on January 8, 2013 by Clare Cooks! This salad wasn’t really planned out. I set about making lunch one day, but was in one of those moods where nothing really sounded good. After hemming and hawing for a bit, I ended up grabbing several random ingredients. Anything I saw that seemed appealing at the time got put on the counter. Not surprisingly these basic ingredients are some of my favorites. Feeling accomplished about picking out items for lunch, I then realized I still had to figure out what to do with them. This salad is what ended up happening. Nothing too fancy, but delicious and filling nevertheless. I don’t like overly oily salad dressing, so I just mixed lemon juice into the lentils instead of making an actual dressing. 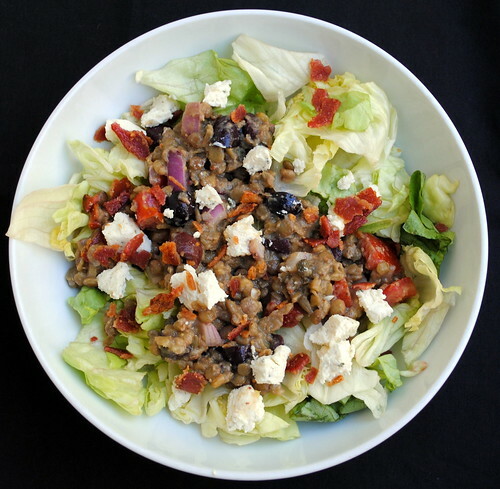 And olive oil lemon dressing or a light vinaigrette could definitely be used on the lettuce or lentils if you like. 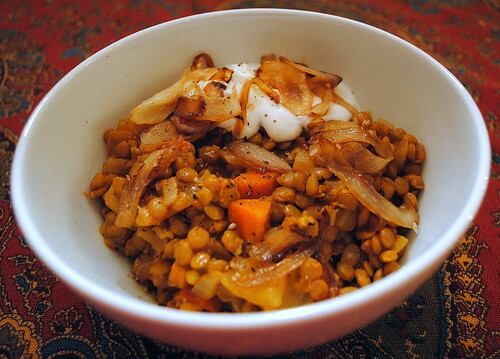 If you are looking for something a little warmer for this time of year, the lentils could also be served warm with all the ingredients mixed in. If serving warm, I would leave out the lettuce and substitute a bed of sautéed spinach. Wash Lentils in a strainer or colander. Pick over and remove any shriveled lentils, debris, or rocks. Thoroughly rinse under running water. Then transfer the rinsed lentils to a saucepan and pour in the broth/water. Add any seasonings being used, reserving the salt. Bring the broth/water to a rapid simmer over medium-high heat, then reduce the heat to maintain a very gentle simmer. Cook, uncovered, for 20-30 minutes. Add water as needed to make sure the lentils are just barely covered. When lentils are done, remove from pot and allow to cool in a serving dish. While the lentils are cooking prepare the rest of the ingredients. Divide lettuce onto individual serving dishes. When lentils are cooled, add onion, tomato and olives and top with lemon juice (and olive oil if using). Mix ingredients together. Crumble goat cheese and sprinkle bacon over the top. 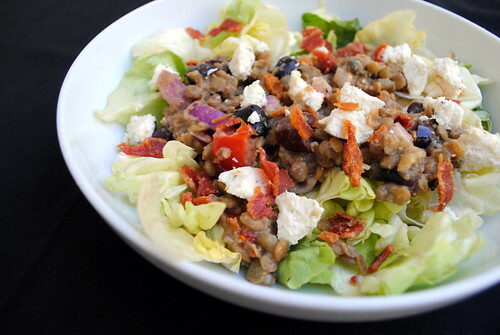 Divide the lentils between the lettuce plates and serve. Posted on November 27, 2012 by Clare Cooks! This is pure comfort food. It’s hearty and warm, salty and savory, and the flavors intensify with every reheating. It’s perfect for a cold, wet, wintry day. I could eat something like this every day when it’s cold out. Something about lentils are just so ‘homey’. They really are perfect in soups and stews. My only misgiving about this recipe was the cinnamon. I hate cinnamon (like a tiger), so I was a bit wary of adding it in. I will admit I only used a very scant half teaspoon of cinnamon. I doubled the paprika to attempt to mask the cinnamon at little better. I could still taste it and it wasn’t horrible, but I think I would have enjoyed the dish a lot more without it. Next time I would probably skip the cinnamon all together and just add a lot more paprika. Paprika makes everything better. Cook the bacon or pancetta in a deep pan over a moderate heat to let the fat slowly ooze out. Roughly chop two of the onions and add them and the garlic to the pan. Cut the carrots into chunks and add to the pan. Cover and let it steam for a few minutes. Add the paprika, cinnamon, then grate in ½ of the nutmeg. Add the lentils, stock, cover and leave for 30 minutes until the lentils have softened. While that is slowly cooking, slice the remaining two onions and, in another pan, cook them very slowly in oil until golden brown. Finish with a grate of nutmeg. The last thing to add to the lentils is a handful of chopped parsley. Serve with a dollop of crème fraiche and pile the caramelised onions on top. Posted on September 24, 2012 by Clare Cooks! I desperately want it to be fall. It officially is according to the calendar, but the weather around here is making the reality quite different. I dream of cardigans and tights and flannels and coats and all the things that are completely useless in Southern California but any temperature under 65 degrees automatically warrants wearing. I keep thinking that if I act like it’s fall, it will be fall. That’s where soup comes in. It might be uncomfortably hot still, but I still keep thinking that if I make seasonally appropriate recipes or wear seasonally appropriate clothes, the season will also become appropriate. Unfortunately, this line of thought has resulted in nothing but annoyance and overheating. Luckily this soup was delicious enough to over look the heat for the 10 minutes it took to eat. I got a hankering for soup over the weekend and saw some lentils in the cupboard crying out to be used up. I opened the fridge and the mushrooms literally threw themselves at me, so I thought it would be rude not to include them as well. I googled around for a bit trying to find a mushroom and lentil soup recipe, but nothing was really leaping out at me. So in typical fashion I chopped up some vegetables, threw them in a pot, minced some garlic, added some spices and broth, added a bit more garlic for good measure, put a lid on it and hoped for the best. I was a bit concerned about the mushrooms getting rubbery (blah), but fortunately they managed to maintain their natural mushroomy consistency and even survived reheating. This soup is basically endlessly adaptable. You could throw in diced tomatoes and their juice for a cup of broth, add some spinach or kale, and just about any other vegetable you could imagine. Prepare and cut up all the vegetables. In a large, heavy bottomed pot, heat the olive oil over medium heat. When heated, add in onion, carrots and garlic and cook until slightly softened and fragrant. Add in spices and mushrooms and stir to coat. Allow water from mushrooms to cook off slightly and add in lentils and broth. Bring to a boil and then reduce heat to a simmer. Allow simmer for 20 minutes or until the lentils and vegetables are all cooked and soft. Posted on May 26, 2012 by Clare Cooks! I have had a block of halloumi hidden in my cheese drawer for a few months now. Yes, I hoard cheese. And yes, I am fully aware this is not normal behavior, but if you have ever had halloumi, you know it’s worth saving until an amazing recipe comes along. This salad is amazing! Amazing I tell you! I knew I was going to like it since most of my favorite ingredients are in it. There is no possible way to not enjoy halloumi. It’s hearty enough for a vegetarian main dish, light enough to serve as a side and endlessly adaptable. I definitely plan to make this again and again this summer. If you can’t find halloumi easily, you could easily substitute feta. You could add a million other things to bring in more flavor to the dish. I think capers, red pepper flakes, balsamic vinegar, spinach, chorizo (or soyrizo), the options are endless. I cooked my lentils in water this time (I was out of broth and bouillon cubes!) and I thought the flavor was still great, but cooking the lentils in vegetable broth would probably make it even better. * – Halloumi, at least in my town can be difficult to find and expensive as hell. If you happen to live in around the Santa Barbara area, I highly recommend getting your halloumi at the European Deli & Market. It’s right where State Street turns in to Hollister. It’s a great little market and has tons of amazing Eastern European/Russia/Middle Eastern things that are usually hard to find in Santa Barbara. Best of all, they several brands of halloumi and it’s over 3 bucks cheaper than the ‘gourmet’ groceries stores in the area. Toss the tomatoes, red onion, garlic, lemon juice and olive oil in a bowl. Cook the lentils until just tender, about 15-20 minutes. Drain and add to the bowl. Season well and toss. Grill the halloumi until golden. 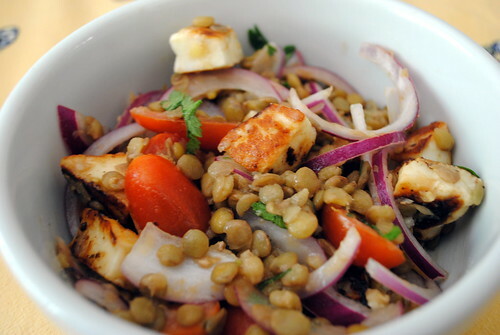 Stir the coriander through the lentils and serve with the halloumi. Posted on May 4, 2012 by Clare Cooks! Yum. I am so into these tacos. They are so simple and so tasty. The possibilities with this recipe are really endless. You can stick to taco shells, but soft tacos, burritos, nachos, burrito bowl, all kinds of options. And depending what type of salsa you add in, you can really adjust the whole thing to your spice leve. I added in some spinach and mushrooms to make use of some use it or lose it veggies. They were definitely a great addition. I also really liked this recipe because I had so many leftovers, which always makes for an easy/lazy lunch or dinner the next day. 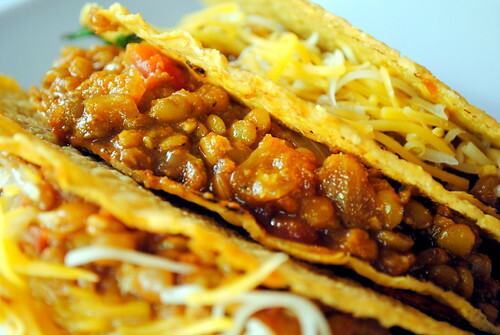 It’s also a nice vegan addition to your usual, fairly meaty Mexican fare (I added cheese to mine, so it was not vegan in the end, but the lentil base definitely is without any of the extra taco toppings). In a large nonstick skillet, sauté the onion and garlic in oil until tender. Add the lentils, chili powder, cumin and oregano; cook and stir for 1 minute. Add broth; bring to a boil. Reduce heat; cover and simmer for 25-30 minutes or until the lentils are tender. Uncover; cook for 6-8 minutes or until mixture is thickened. Mash lentils slightly. Stir in salsa remove lentils to large serving bowl. Add in baby spinach and mushrooms into skillet and sauté until cooked. Spoon mushrooms and spinach into taco shells (if using). Spoon about 1/4 cup lentil mixture into each taco shell. Top with lettuce, tomato, cheese and sour cream, etc. if desired. Posted on January 27, 2012 by Clare Cooks! It might not be the prettiest of soups, but it’s what’s on the inside of the bowl that really counts. This was one of those, clean out the fridge, cross your fingers, and hope for the best type of concoctions. I was super impressed by how tasty it turned out. It actually reminded me more of a stew than a soup since it wasn’t thin like a soup. It was very hearty and filling, simple to make, and made the perfect amount of leftovers to enjoy two days in a row. It was tasty enough to not mind eating two days in a row. Saute the onion and garlic in the olive oil, until softened. Add the grated carrot and cook for a few minutes. Add the spinach and let it wilt. Next add the vegetable stock and the lentils. Stir well. Cook over a medium heat for 30 minutes. Then blend until the carrots and spinach are smoother. Add the lemon juice and can of tomatoes, stir to combine and let tomatoes heat through. Season with salt and pepper to taste. Sprinkle each serving with a little chile powder or paprika, if desired. Posted on December 13, 2011 by Clare Cooks! This soup is so easy to make, it’s almost foolproof. It also takes next to no time at all to whip up, so it’s perfect for a fast weeknight meal. There is a bit of a kick to the soup (it’s easy to adjust to your taste), but it helps make this hearty and filling soup nice and warming, which is great for a wintry day or evening. I thought the heat factor from the chili was just about perfect. I might even go a little crazy next time and add in some sriracha or garlic-chili sauce. You could even you fresh chiles or jalapeños in place of the chili flakes if you wanted, or use both if you are really crazy bout spice. Next time I would definitely add in some more garlic and maybe squeeze in some lemon juice before I served it, but recipe is pretty close to perfect as is. Heat a large saucepan and dry-fry the cumin seeds and chilli flakes for 1 min, or until they start to jump around the pan and release their aromas. Add the oil and onion, and cook for 5 mins. Stir in the lentils, stock and tomatoes, then bring to the boil. Simmer for 15 mins until the lentils have softened.